I woke up about 5 o'clock this morning, sensing a change in the ship's engines. When I first looked out, I saw the ship appeared to be in between 2 piers. Half asleep and confused, I went back to bed. Then I felt the ship moving down instead of horizontally and remembered that the captain said something about going through a lock. I got up to look again and saw that the ship was moving out of the lock and into the harbor. We had breakfast in our room again so we could get to our tour on time. Ray felt like he is coming down with another cold and decided to stay on-board, so I went on by myself. It was very cold out today, probably in the 40s, with wind on the pier making it feel worse. 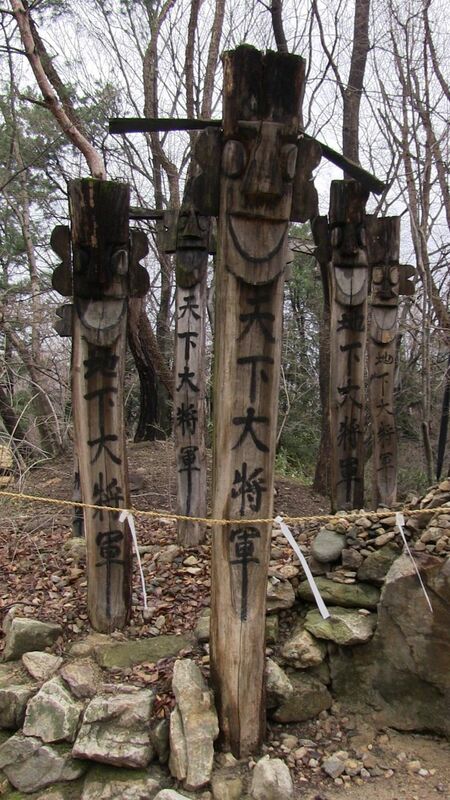 Today's tour was to a "Korean Folk Village." It was about an hour bus ride from the ship. 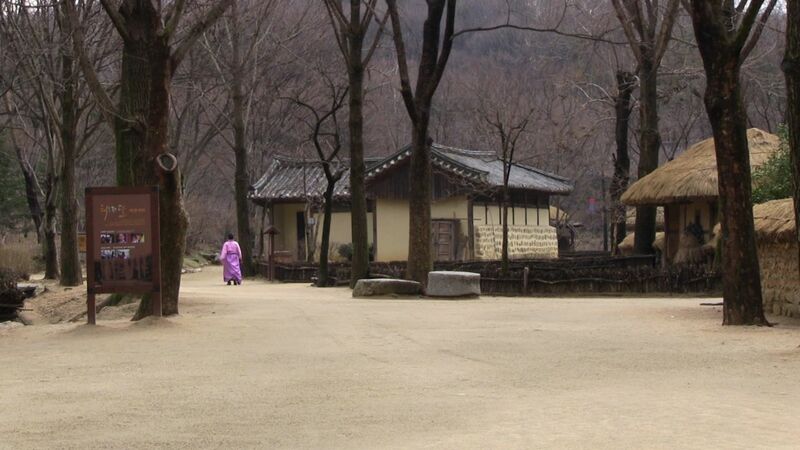 This turned out to be a replica Joseon Dynasty village, something like Williamsburg, but without the actual craftsmen in the buildings. Each building was outfitted with artifacts representing a local craft and some had dummies dressed in period costume. There are various shows staged every hour during the day, demonstrating arts of the period. When we arrived, the Farmers' Dance had just begun. This was a combination of traditional music, dance, and juggling. The music of Korea is not on the top of my list, but the dance was fun to watch. We then took a walk and the guide showed us the building that would have been the court. She told us about the various punishments that would await someone who committed a crime. Some were similar to European stocks. There was also a jail with dummies in the cells. They all wore a long board on their necks with only a hole for their neck. Our guide then took us back to the show area to see an equestrian show. 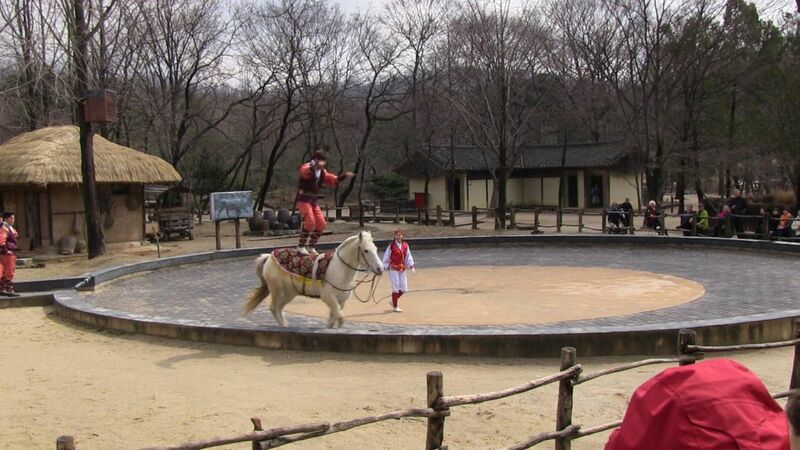 Riders brought their horses into a circular arena and performed various stunts. They were very good. It's hard to explain so you'll just have to wait for my video. Next we had time to visit a set of buildings that would have been the home of a wealthy man. Near the gate there was a small one room building for servants. All the buildings were only one room deep, and all were entered through a door facing the central courtyard. Moving clockwise around the courtyard, the first building was for the husband. There was a bedroom and a study. The kitchen and storeroom appeared to be next. At the back of the courtyard were the rooms for the wife, husband's mother and children. They were heated by a fire built in a room to one side, with the heat directed under the floor to the rooms next to it. The buildings on the opposite side of the courtyard from the husband's rooms appeared to be more storage. 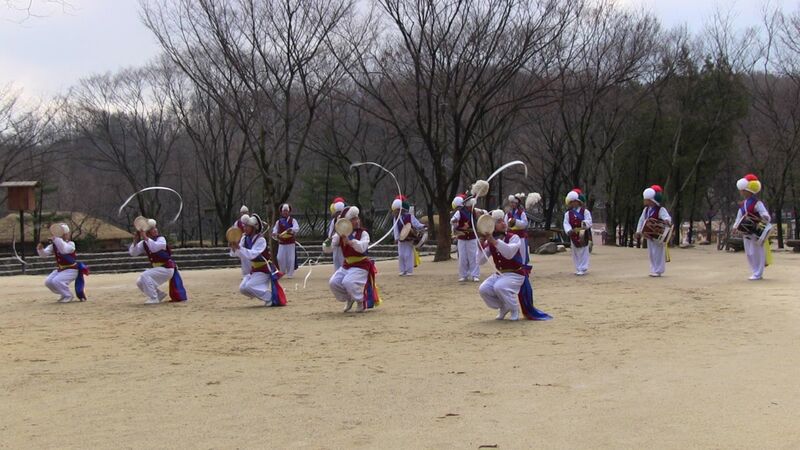 The last show we saw was a reenactment of a traditional Korean Confucian wedding. This was an interesting ceremony. It was narrated in Korean, so our guide explained it to us before the show and we just had to try to follow along. Two women assisted the bride in getting up and down. They have no chairs, but squat when they are at rest. The "priest' was in the middle and two attendants stood at the sides to assist, bringing cups to the bride and groom to drink from. Our guide explained that up until recently, couples often never met until the wedding day. Men were king in their house and women were kept in the back rooms to limit their exposure to outsiders. She said that much of this is only now beginning to change. She was probably in her 30's and had only been married 3 years. She said at first her mother-in-law called every day, telling her what a good wife she was for her son. One of the obligations of a new wife is to cook a meal for her mother-in-law, so a few weeks after the wedding she invited her mother-in-law to dinner. After dinner, her husband began helping with the dishes and her mother-in-law got very upset. Our guide said her mother-in-law did not call again for months. Now after 3 years, she has begun to accept that today, because both husband and wife work outside the home, the husband helps with household chores. She accepts outwardly, but not in her heart. We saw another building after the wedding, which our guide said explained how they make kimchi. 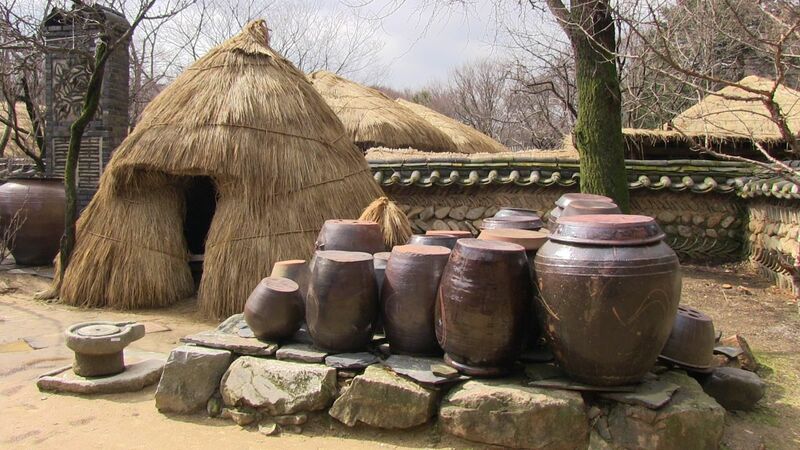 There were large pots around it that she said the kimchi was stored in for up to 3 years. On the ride back to the port, our guide talked a little about the situation between North and South Korea. SHe said many South Koreans are on the list requesting to visit relatives in the North, but ply 200 are allowed to cross the border each year. South Korea is on high alert since Kim Jung-Un made some serious threats a few days ago. The U.S.A. and South Korea are also conducting military drills this month. Things are just a bit tense in this area at the moment, but when we asked our guide about it, she said this is pretty normal for them. North Korea makes a threat or does something to provoke them every couple of years. So far South Korea has kept their cool. From what I heard in Dr. Elovitz's lectures and other things I have learned on this trip, North Korea seems like a petulant child throwing an occasion temper tantrum to get what it wants. It doesn't have enough food or natural resources to survive and recent U.N. sanctions are hurting them. At any rate, I will be glad when our ship is away from these waters. It's about 5pm now and we should be leaving the pier any minute now. The captain announced that the seas are going to be a bit rough tonight, so they postponed the show with the ship's dancers until tomorrow night and are putting on a comedian instead. The crew show is still scheduled as an early show at 6pm though. I hope we aren't out in the rough waters yet when they are on the stage.